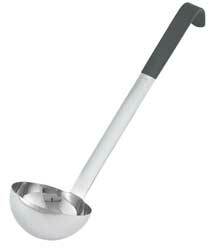 Ladle, Capacity 1/2 Oz., Temp. Resistance 180 Deg. F, Bowl Dia. 1 3/4, Gauge Heavy, Handle Plastic-Coated, Handle Type Angled, Handle Color Black, Handle Length 6 In., Material Stainless Steel. Can be used for soups and other.